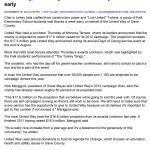 On November, 15 United Way of Dane County announced it’s projecting to reach $17.6 million for its 2012 Campaign. Nick Meriggioli, 2012 United Way Campaign Chair and President of Oscar Mayer, kicked off this year’s campaign at the Days of Caring at the end of August with the announcement of a challenging goal of $17,500,000. The community responded with more than 38,000 individual and 1,100 corporate donations. The event was generously sponsored by American Family Insurance. Clad in turkey hats crafted from construction paper and “Live United” T-shirts, a group of Falk Elementary School students said thanks a week early on behalf of the United Way of Dane County. United Way held a luncheon Thursday at Monona Terrace, where its leaders announced that the charity is projected to reach $17.6 million raised for its 2012 campaign. The projection exceeds the $17.5 million goal United Way announced during its annual Days of Caring service event at the end of August. The United Way of Dane County is projecting it will raise $17.6 million in its 2012 fundraising drive, exceeding its campaign goal of $17.5 million. The announcement was made during a campaign celebration Thursday. 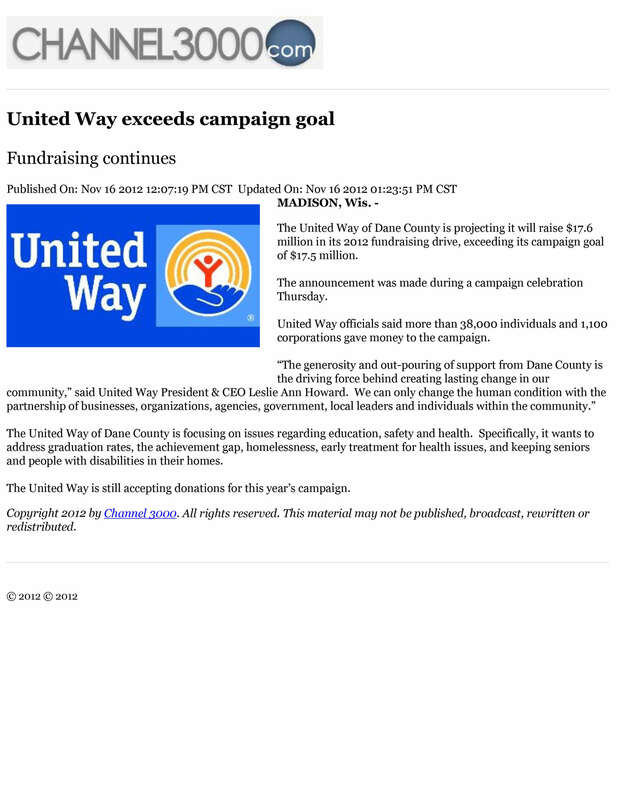 United Way officials said more than 38,000 individuals and 1,100 corporations gave money to the campaign.